“Team race” races started at 11:00 on Pärnu river. A spectacular competiton gave a lot of emotion to both the audience and to the sailors themselves. “It was an astonishingly successful day! If at yesterday’s meeting we were discussing how many races should we even have, because it could be difficult to carry out 45-minute races, than today’s result was actually easy and gave a spectacle to the viewers. I also want to applaud the team on the sea, who gave their very best to carry out today’s races,” said Jüri Sõber, the head of the races. 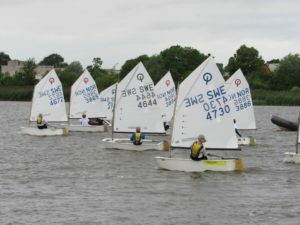 In the beginning of the racing day the weather was cloudy and gave the sailors good wind. At noon the wind became too strong and the races were suspended, but altogether it gave the sailors a nice break to gather some energy. The competitors went back to the sea at 15:00 and all of the planned races were carried out. The final races started on time and the online broadcasts also happened on time. Postimees (one of the biggest newspapers in Estonia) broadcasted the races online at their own webpage and the races were also shown on the big screen at Pärnu Keskus shopping mall. Six countries – Denmark, Sweden, Finland, Latvia and Estonia – took part of the races in the Optimist class. The Finnish team, consisting of Amanda Vuotilainen, Aada Maula, Hanna Lehtinen, Anna Partti and Xiaojian Keinänen won the “Round Robin” race. The Swedish sailed to the second place and the Latvian team took the third place. Both the Finnish and the Swedish teams went on to the finals and the Swedish team won both of the final races. The Swedish team consisted of Maya King, Flippa Henriksson, Elsa Aronsson, Luise Zetterström ja Jannifer Öhrnell. The best team among the male sailors was the Swedish team, which consists of Simon Granath, Rasmus Granzin, Christoffer Hallin, Johan Bengtsson and Victor Björk. The Swedish team won both the “Round Robin” and also the finalraces. The Latvian team came second and the Finnish team came third.